The RSC’s joyous, music-filled Don Quixote transfers to the West End for a limited season at the Garrick Theatre from 27 October. David Threlfall and Rufus Hound return in RSC's Don Quixote at the Garrick Theatre. Tickets are sure to go quickly so secure yours now! After a lifetime of reading books on chivalry, one eccentric old man heads off on a rumbustious quest to become a wandering knight accompanied by his faithful and equally ill-suited servant, ’riotously performed by David Threlfall as Don Quixote and Rufus Hound as Sancho Panza' (The Times). Taking up a lance and sword, Don Quixote sets out on a hilarious journey across medieval Spain, defending the helpless and vanquishing the wicked. Hopelessly unprepared and increasingly losing his grip on reality, with each calamitous adventure the two hapless heroes experience, the romantic ideal of Quixote͛s books seems further away than ever. Following its sell-out run at the Swan Theatre in Stratford-upon-Avon in 2016 to mark the 400th anniversary of Cervantes' death, the Royal Shakespeare Company's ‘joyous' (Guardian) production of this legendary comic novel is told by a company of 20 actors accompanied by a band of live musicians. Adapted for the stage by James Fenton (The Orphan of Zhao, 2012) and directed by Angus Jackson (Oppenheimer, 2014 / ROME MMXVII, 2017) this 'boisterous romp' (The Times) arrives at the Garrick Theatre for a strictly limited 14-week season from 27 October. 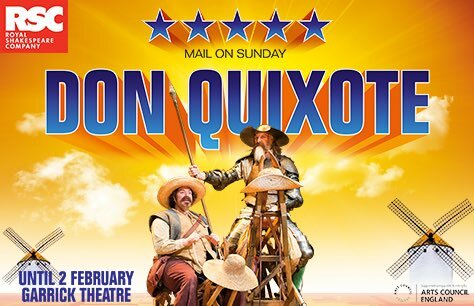 ​Book your Don Quixote tickets now to ensure the best seats at the best prices and avoid disappointment! Thoroughly enjoyable. Good be miked at little better but a minor cavil. Funnier than I was expecting. Rufus Hound excellent, David Threlfall marvellous. Everyone looked like they were enjoying themselves on stage and this translated to the audience. Great night out. This was so funny and brilliantly performed by a thoroughly competent and hard working cast. The lead actors complemented each other so well. Best theatre I have seen for a while.